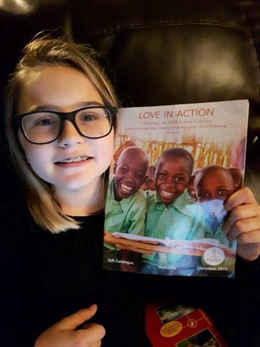 This year, 12-year-old Jane puts her "Love in Action"
Canadians all across the country are living "Love in Action" with our 2018 Christmas gift catalogue. When you give a gift through our catalogue, you'll provide essential needs to vulnerable children and families in the developing world. Your gift is two gifts in one - you can honour a friend or loved one with your donation, and they'll receive a beautiful handwritten card telling them of the special gift purchased on their behalf. Twelve-year-old Jane, from Tignish, P.E.I., has been hard at work putting her love in action this Christmas season. When Jane and her mother, Lisa, received this year's catalogue in the mail, Jane expressed her wish to help others. "Jane loves seeing the catalogue every year," Lisa says. "When it arrived, she decided she wanted to do something for those less fortunate this Christmas - so she asked her family members to fill a basket that she could sell tickets on." Jane is using all of the proceeds from ticket sales to buy items for those in need through the Chalice Christmas gift catalogue. Lisa started teaching Jane about the importance of caring for others at a very young age. When Jane was three years old, their family began sponsoring a child through Chalice. "Our sponsored child, Alanis, is from Paraguay. She's now 12, just like Jane." They keep in close touch with Alanis, and Lisa describes Chalice as "near and dear" to their family. 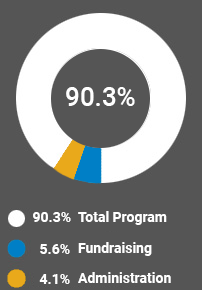 So far, Jane's raised over $400 through ticket sales, and isn't done yet! She's working hard selling tickets, and has some dates booked to sell to customers at local businesses. She and her mother are also responsible for distributing gift catalogues at their church, Parish of St. Simon and St. Jude, and are making sure everyone sees this year's catalogue! Lisa is so pleased with Jane's efforts. "I'm beyond proud of her giving heart," she expresses. We'd like to offer our sincere thanks and blessings to Jane and her family - thank you for making a difference for others this Christmas!